Taking a breath between gigs on her seemingly never-ending tour, Jennifer O’Connor and her band stop by Austin’s KUT to perform a special live session. Austinites can hear it on Thursday (1/22) at 2PM on 90.5 FM, while the rest can stream from kut.org. There’s more information to be found here. 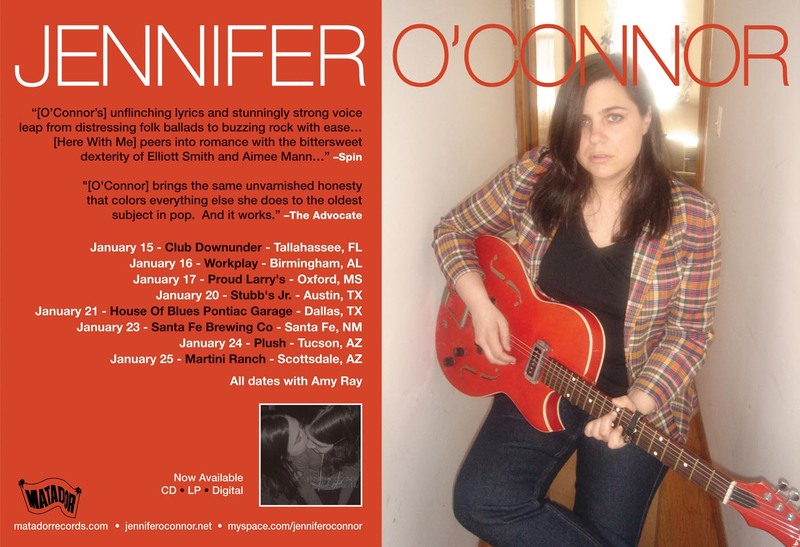 …followed by February and March solo dates. If we don’t see you at one or more of these, hopefully it’s just the poor lighting. 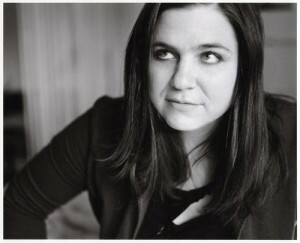 Jennifer O’Connor recently donated her time and her beautiful song “Sister” to the Stand Up to Cancer organization. Stand Up in turn commissioned a lovely video for the song. Cheers to Stand Up and to JOC for working on behalf of a worthy cause. 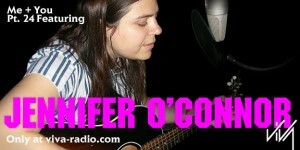 Jennifer O’Connor : New Song On Ugandan Benefit Comp. 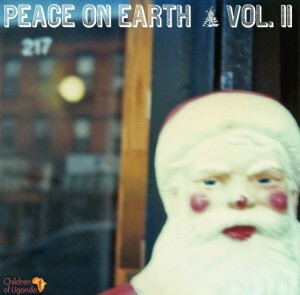 I recently recorded a version of “Deck The Halls” for a Christmas compilation. Caleb Palma of the awesome Hard To Find a Friend blog asked me to contribute and I did (as did the likes of like Oxford Collapse, Bodies of Water, Jason Colett, American Analog Set and more….). The comp is available for $7.50 as a download right here, and 100% of the proceeds will go to the Children of Uganda Fund. Last night we played at the Beachland Tavern in Cleveland and we visited Music Saves – a very cool little record shop around the corner from the venue. 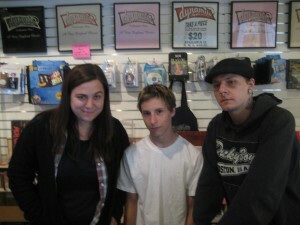 I talked to owners, Kevin and Melanie. 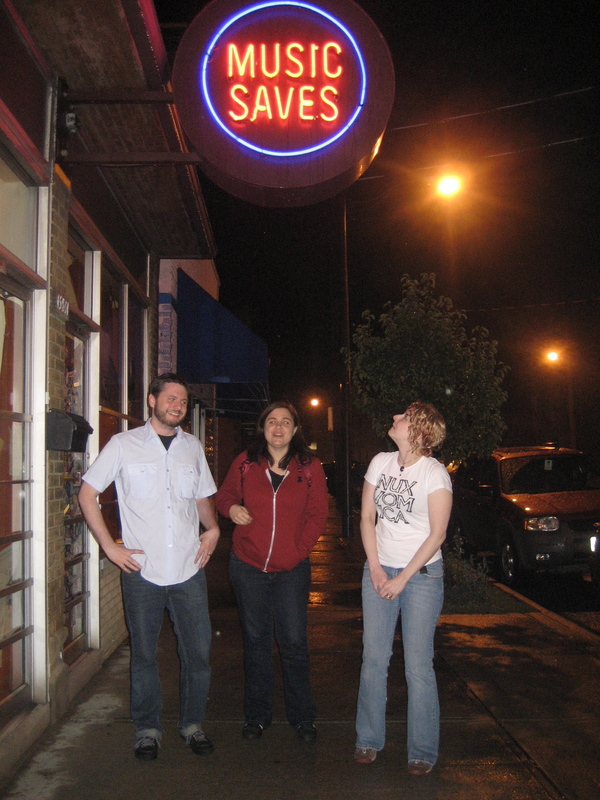 Here’s a pic of us after the interview in front of their very cool neon signage. JO’C: This is your store, right? How long have you been at it? JO’C: What’s the best thing about running this store? Kevin: All the money you make from selling independent records. JO’C: Ha! Right… I’m familiar with that perk as well. Melanie: Seriously, we are fans and it is really awesome to be able to be in the unique position where we can really help bands out in a way we couldn’t if we didn’t have this store. If we love a record or a band we can really push them and turn people on to them. JO’C: How does being in such close proximity to the Beachland Ballroom affect your business? I assume that’s why you chose this location, right? Melanie: Yes, that’s why. We work together with Beachland. 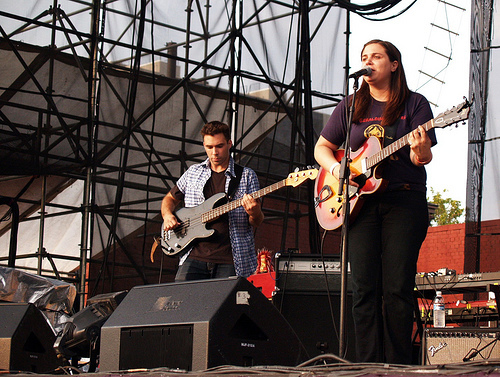 We sell tickets to the shows and help promote the bands that play there. We put on shows with them sometimes. We are all good friends and part of the same community. JO’C: Do you stay open late on show nights? Melanie: Yes, sometimes. 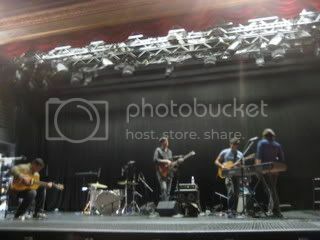 We did recently for the Neko Case show. 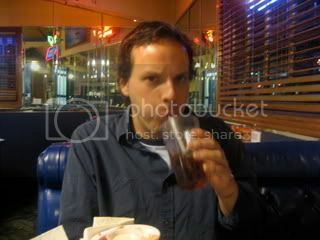 Kevin: We once stayed open until 3:30 in the morning for a Guided By Voices show. JO’C: That’s awesome. 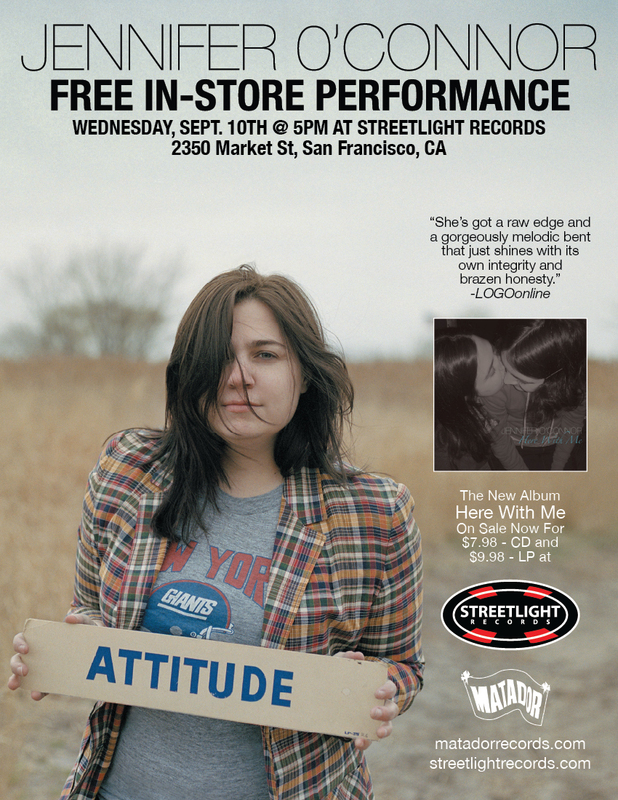 I love the idea of being able to shop for records before, after or during a show. Do you guys have a prized record in your own personal collection(s)? Kevin: I’m not so much of a collector. Melanie: Yeah, but we do have some stuff. We have like 6 copies of that first Menomena record where it folds out into a monster. There are only like 500 copies of those. We each got that for eachother for Christmas that year. JO’C: Aw, that’s sweet. You guys are married, right? JO’C: Ok, just a couple more questions. What’s your favorite place to eat in Cleveland? Melanie: It’s full name is Melt Bar & Grilled. 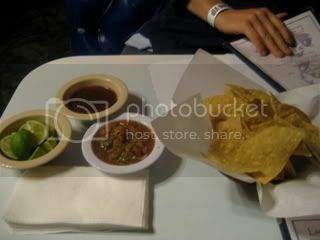 JO’C: Yum! 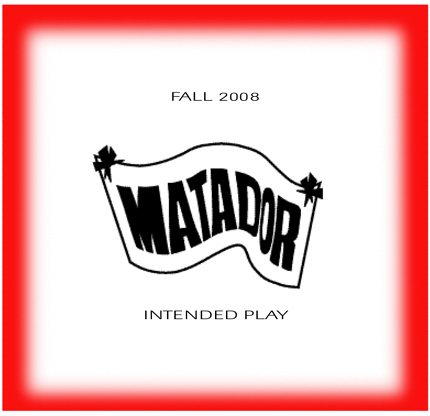 And its getting to be the time of year for this question….What’s your favorite record of 2008? JO’C: They just did an instore here today right? Kevin and Melanie also professed a love for the new Marnie Stern record but thought maybe it was too soon to add it to their favorites of the year list. Jon Langmead got some used Willie Nelson vinyl and we went and played our set at the Tavern. Nick Lowe was playing the big room next door and I got to hear half of “(What’s So Funny ‘Bout) Peace, Love, and Understanding” before we went on – which was pretty cool. 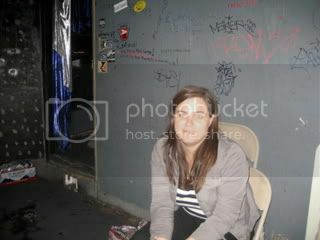 I also met Amy Rigby and Wreckless Eric who were in attendance. So, all in all, a pretty chockful day. 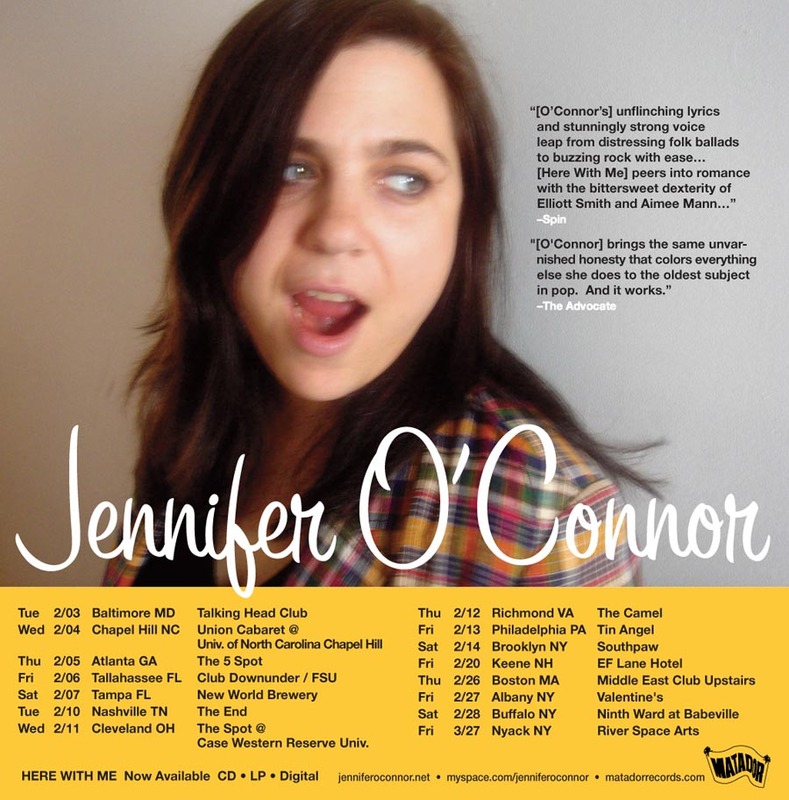 In addition to mid-October shows supporting The New Year, Jennifer O’Connor — continuing to crisscross the USA on behalf of her fantastic new LP/CD, ‘Here With Me’, is hitting some larger rooms from Nov. 2 to Nov. 22, opening for Amy Ray. Michael and I did a duo show a week or so ago in Northampton and I used this as as an opportunity to resume my record store interviews. We hit up Dynamite Records in Northampton, which had moved to my surprise, but we tracked them down. I spoke to Lane and Willis. JO’C: How long have you worked here? Lane: Burger King Double Cheese Burger! JO’C: What’s the last great show you went to? JO’C: What’s the best record you’ve come across lately? 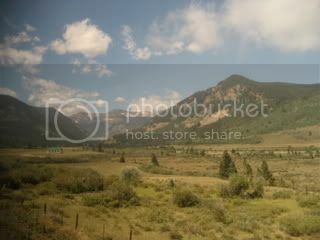 JO’C – Did you get it here at Dynamite? Willis: You really got it from me! Lane: Well, yeah, but that’s through here. JO’C: Ok. If you could meet any musician or band, dead or alive, who would it be? JO’C: Anything else we should know about Dynamite? Willis: We are the best record store in the Valley. JO’C: Ok, I’ll be sure to let everyone know. This did seem like a pretty cool store, though it seemed like they had considerably less stock than in their previous location, but I think they are still in the process of moving. Lots of vinyl – reasonably priced. Look out for many more record store interviews in the coming weeks as we are about to head out for over a month. Feel free to check out the tour schedule and send along your recommendations! Another year, another fund drive for WPRB, Princeton’s non-profit radio station. WPRB and Jon Solomon welcome the return of Jennifer O’Connor for the station’s annual membership drive. 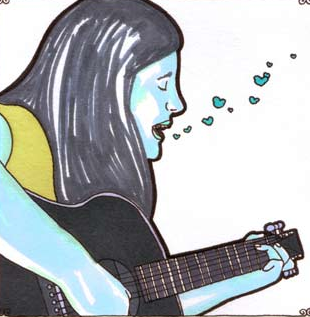 Similar to last year’s program, Jennifer will be performing covers by request of pledgers. Tune in tonight at 7PM EST at 103.3FM for those in the NY/NJ/PA area and at www.wprb.com for the rest. 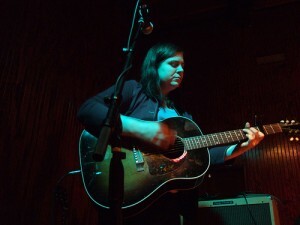 Jennifer O’Connor will be performing live on WNYC’s Soundcheck with John Schaefer today at 2:30PM at 93.9 on your FM dial in NYC and online at wnyc.org. Be advised that we’re gonna suspend all promotional campaigning on the Matablog until the national’s financial crash is sorted out. Or until later this afternoon, whichever comes first. 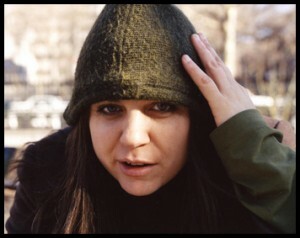 Jennifer will also be playing the Mercury Lounge tonight (10:30) and Brooklyn’s Union Hall on Sunday, both gigs in support of Great Lake Swimmers. I apologize for the use of the word “free” in these instances. I don’t know when we’ve charged money for an instore previously, and if someone did make you pay $5 (for instance) to see one of our bands perform in a record shop, might I suggest you’ve been a victim of a subway troll moved overground? 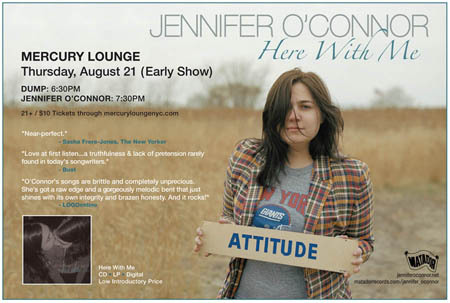 Is Jennifer O’Connor The Hardest Working Woman In Show Business? With all due respect, probably not, But if by suggesting otherwise we can get the actual hardest-working-woman-in-show-business to send us a threatening letter, we’ve got more great material for the Matablog. Jennifer’s frequently updated touring on behalf of ‘Here With Me’ includes the following, newly-confirmed dates. Author GerardPosted on August 27, 2008 Categories concertos, Jennifer O'Connor3 Comments on Is Jennifer O’Connor The Hardest Working Woman In Show Business? Jennifer O’Connor – Permanent Records Greenpoint – Free In-Store! 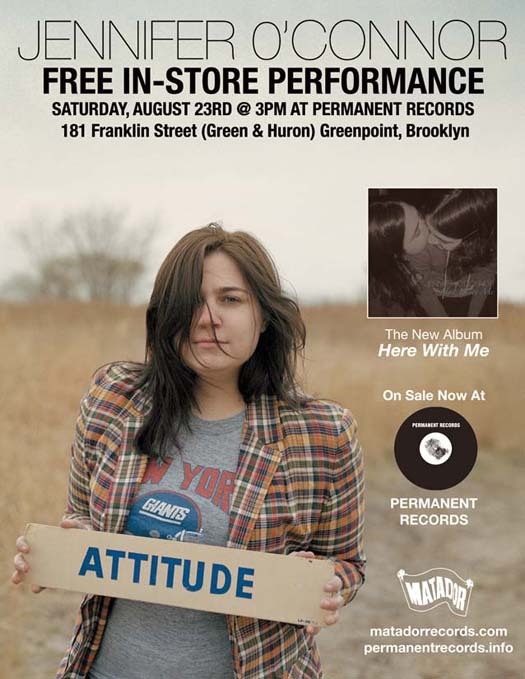 Jennifer O’Connor will play a Free In-store at the lovely Permanent Records in Greenpoint this weekend, Saturday, August 23rd at 3 PM! What a wonderful way to spend a Saturday afternoon, and you can pick up a copy of her newly released album, Here With Me. New/exclusive version of four of ‘Here With Me”s standouts, available now for free download from Daytrotter. Illustration by Johnnie Cluney. From the album, ‘Here With Me’ (OUT TODAY), video directed by Zacarias Bezunartea, hosted by Stereogum. Please keep in mind, Jennifer and Dump will be playing NYC’s Mercury Lounge tomorrow night to commemorate the release of ‘Here With Me’.